Which sauna type should I choose? Rectangular sauna is the most spacious, and because of its shape, even a very tall person will feel comfortable in any corner. A little portable table in a dressing room makes you feel like in a little cabin and is very practical as well, but the best thing here is that you may have two big windows on both walls if you choose doors from the side. 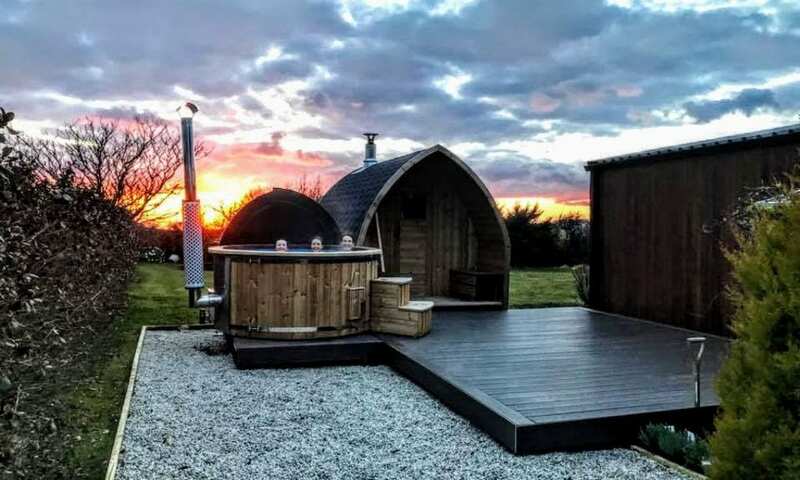 Barrel sauna heats up quicker as the round shape saves space, so smart and functional. Igloo Sauna has a unique and traditional shape that was specifically created for high and snowy areas. The roof is completely covered in bitumen shingles from top to the ground and is protected from different weather effects. Only vertical sauna has one size and is designed for small families that do not have a lot of space in the garden but still wants to enjoy the benefits of the outdoor sauna. Looks like a cute tiny house though. It is very important to evaluate the needs and also possibilities. Sometimes, a bigger sauna is what you wish, but the area is too small and etc. Therefore, here we have a little table that shows how many people fit in a certain type and size of the sauna. This data reflects only the size of the sauna room. If you order a sauna of 5 meters, but 2 meters changing room, then the sauna room is only 3 meters and 4-6 persons fit there. I hope it helps you to understand and decide the best size for your sauna. When you choose the final length of the sauna, think of the room division, or you can start the other way around and then see how long your sauna must be to fit everything you would like to. Have you thought about changing room or terrace? Even though the changing room is optional, later you might regret not having it in your sauna, therefore think well about it until it’s not too late. Of course, if you have another room close to the sauna which will serve for this purpose, great, you can have a bigger sauna room then, but for others, this little room is highly recommended. The size of it may vary depending on your needs, however, it should be at least 1 meter long. The changing room is equipped with benches, and additionally, we may add some shelves over the benches to place your personal belongings. Our task is to make your sauna as comfortable as possible, therefore, do not hesitate to tell us your ideas. The little-roofed terrace in front of your sauna does not only look beautiful but is also very practical. This open area is perfect for relaxing before or after the sauna session. Imagine having a cup of tea under a starry sky at night, and even when it rains you do not have to worry about it. Wooden benches on the porch are always included therefore you won’t have a headache about additional furniture. As the length of the terrace is optional, we may adjust it to your preferences. Three models may be equipped with half panoramic or full panoramic window in your saunas, only vertical one can have little windows. What is more, you do not have to lose this possibility even though you choose the unassembled sauna. It is especially relevant for people living in limited access areas that can be reached only by a small transport. Half panoramic window can be transported by a small transport and be mounted in barrel saunas of maximum 4 meters length. Other variations are possible but can be transported only by bigger trucks. Therefore, we will always advise which option, already assembled or a flat packed is better for you, based on the area and delivery options. We offer an extensive range of Harvia heaters for different saunas to comply every bather’s needs. We offer both electric and wood burning heaters. You may also choose if you want to load the logs from the inside or the outside, and additionally, to create a steam effect, it is possible to add water tank on wood-burning heaters. Some of the electric heaters may be equipped with the control unit, which is the perfect solution if you want an easy operation of the heater from the outside of the sauna room. All Harvia heaters have a CE marking, which is mandatory in all countries on the European economic area, in addition to CE requirements, Germany has national requirements (BImSchV), and therefore, there is a special collection to comply this marking. Before ordering a sauna, you should know all the local requirements and have the permissions if necessary in your area. Here is our final table, with all the advantages and disadvantages, when on the other hand, it depends on the situation. Sometimes, one size is enough and exactly what one needs. The table is based on our customers’ most popular choices and most commonly asked questions; however, your opinion can be completely different, therefore we are ready to find it out and make your dream sauna. • Flat packed can be transported only by a 25t truck. If you need more information then check our articles below!